I'm reading 'A Woman in Berlin' at the moment. It's an autobiographical account of a woman who was living in Berlin during the Russian occupation after World War II. I just came across this passage, which describes the park just by my flat here in Berlin. We clambered past the cemetery in the Hasenheide park - long, uniform rows of graves in the yellow sand from the last big air raid in March. The summer sun was scorching. The park itself was desolate. Our own troops had felled all the trees to have a clear field for shooting. The ground was scored with trenches strewn with rags, bottles, cans, wires, ammunition. I can't find any photos or illustrations of what it looked like, but I did come across these two images of Hasenheide from around the same time. 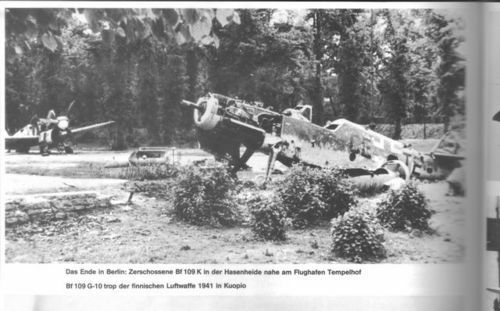 This one, taken from the book “Die 109”; from Motorbuch Verlag, and copied from this site, says it was taken in 1941. The passage quoted above is written four years after that in 1945, and then comes this photo, taken in 1947. 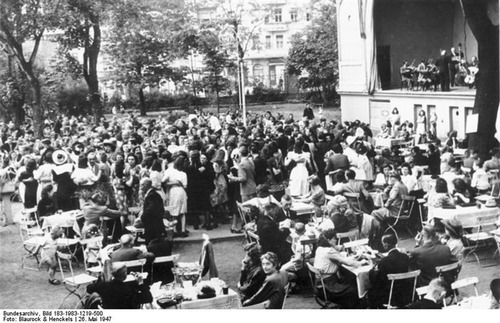 It's entitled 'Dancing in Hasenheide' ; seemingly, it didn't take long for the park to regain its true purpose within the community. I'm finding reading such alien accounts of somewhere that I know well quite haunting, especially as the book is an unedited diary, full of very raw emotion and fairly graphic accounts of the abuse that the author and her peers underwent during the Soviet occupation.